be used in 1310 nm emitters at some cost penalty. 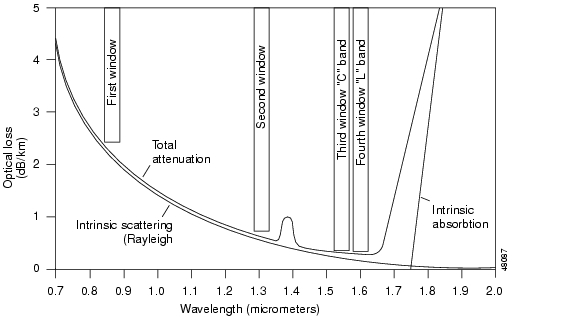 Laser output power and spectral width comparisons. Vivek Alwayn. This is a part of the free sample chapter. attenuation parameter for G.651 fiber is typically 0.8 dB/km at 1310 nm. band. It can also operate in the 850-nm band. step-index structure and is optimized for operation in the 1310-nm band. typical chromatic dispersion at 1550 nm is high at 17 ps/nm-km. 0.2 dB/km at 1550 nm, and the PMD parameter is less than 0.1 ps/km. An example of this type of fiber is Corning SMF-28. note: This is the fiber type for the 802.3z Gig-E LX fiber specification. the power limit rather than dispersion. There are four tables in the standard. A and B have a water peak. C and D eliminate the water peak for full spectrum operation. This is cable made with G.652 fiber. Maximum attenuation at 1300 or 1500 nM is 1 dB/Km. This is cable made with G.652C fiber. metro CWDM applications over a broad wavelength range. at 850 nM is degraded: 200 MHz-Km. 850 nM of 500 MHz-Km. a collimated launch that does not fill the fiber aperature. to 1600-nm region. This fiber has a low loss in the 1550-nm band. area. These fibers have a high chromatic dispersion at 1550 nm. Nonzero Dispersion Shifted Fiber (ITU-T G.655) Prestandard versions introduced in 1996. NZDSF with respect to SMF and DSF. operation at more than one wavelength. that allow operators to most efficiently handle this. attenuation coefficients in the C and L bands as G.655. December 2006 -- Cooked up for the cable TV and FTTH industries. some much-needed clarity to an often confusing state of affairs. minimum performance requirements with ease. performance specified for different applications. catch: G.653 only works well for single-channel systems. much higher power levels, allowing extended transmission distances. crosstalk and interference between channels. to-the-Home pilot network in Eindhoven. I designed it ;-) ERa]. dors' offerings for each class of fiber. The bottom line is this: there is no substitute for information. you're dealing with and treat it accordingly.